At the start of the year there was a potentially scary report by the Census Bureau and highlighted by The Oregonian. The headline says it all: “Kid heavy states? In the West, yes, but not Oregon.” Scary because we’re looking at a coming decade of slower economic growth, predominantly due to the aging Baby Boomers. The antidote for such an outlook is young, working age families, so seeing a report that shows Oregon is lagging behind, at least in one of these areas, is scary. However, it turns out to more a function of age structure than truly lagging behind. These first graphs below show population growth in recent decades by age. 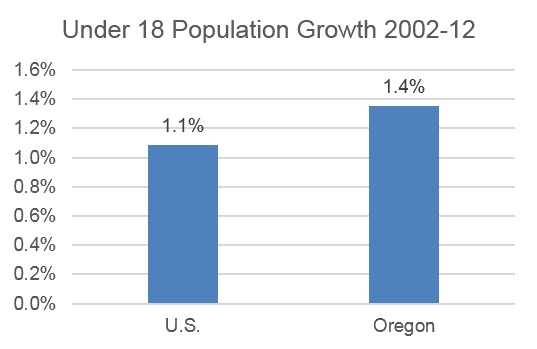 In the 1990s Oregon saw very strong population growth in the Baby Boomer cohorts (at that time about 35-55, roughly speaking) along with their children, the Millenials. 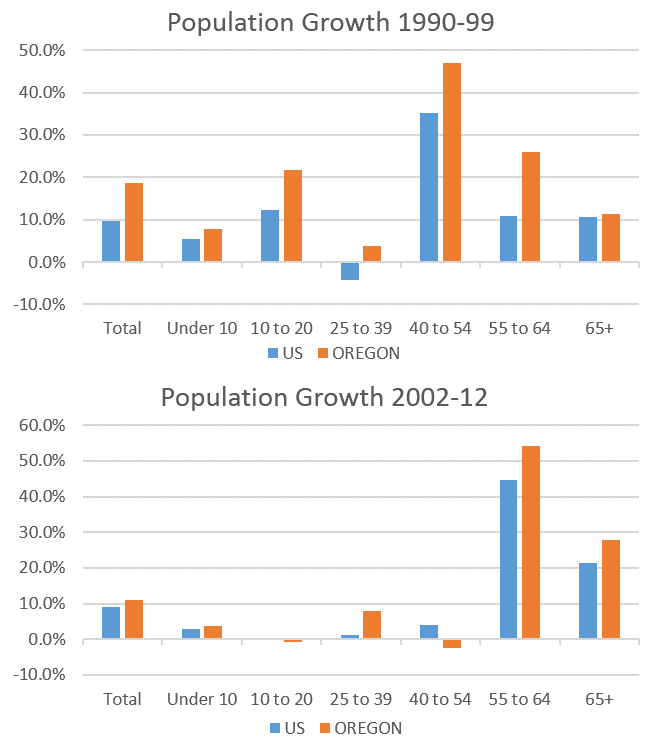 In the 2000s, Oregon again experienced stronger population growth in the Baby Boomer cohort and among the older Millenials and younger Gen Xers. So what does this do to the age structure after a few decades? It makes Oregon just a bit older than the average state. 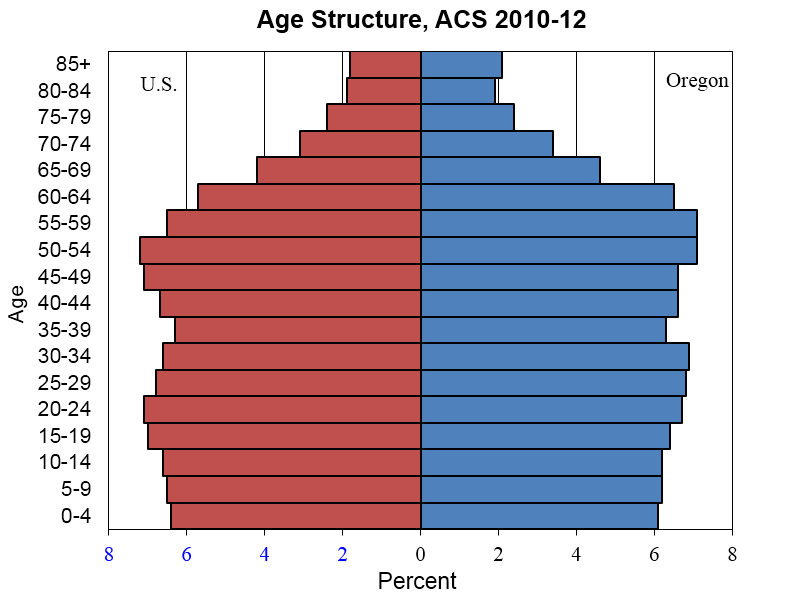 Based on the 2010-12 ACS estimates, the median age in Oregon was 38.7 years while the national average was 37.3 years. You can see that in the pyramid graph below. It also shows the larger share of Oregonians in their “root setting” years as discussed previously when examining the housing outlook. However the reason the report is not as scary as the headline is the fact that our under 18 population group has grown just a bit faster than the national average in the past decade, albeit just barely. The reason the overall share is lower is due to the much stronger growth in Baby Boomers which outpaced the national average even more. Now, for longer run economic growth we would love to see that growth rate differential a lot higher than the national average for both the under 18 population and the young working age population, but being above average is certainly better than not. Enjoying your posts as always, and very impressed with your productivity. A minor point – your age categories for population growth have a gap – should it be ages 10-24 instead of 10-20? Thanks John and yes, there is a missing age category for college age individuals. Omitted on purpose to try and simplify the graph a little but I guess only leaving out one group does not do much….